If you believe that all your contracts, policies and procedures are out of date and would like to start from scratch, there is no cost for an MOT, we will just provide you with a quote to provide you with everything you will need. If your organisational needs are complex with many specialist policies and a variety of contracts we will have to charge more than for a usual MOT. Of course we will warn you of this when we first meet. Once you have become a Resource First Ltd client, you will also receive a bulletin twice a year informing you off all the latest legal and best practice updates as well as warning you of upcoming changes. * These figures are average estimated costs. 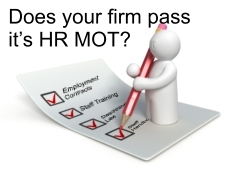 For a better idea of the cost your business may be quoted please contact our HRMOT team.